But let’s be real. I’m not a tea cozy kind of girl. Which is why there’s another reason I love Martha. Because she is a former convict. Remember that? Remember when Martha Stewart went to jail, and the world was like um…what? And then she got out of jail, and continued being the classy lady she always was. Like, yep, I did my time, and I still make a mean key lime pie…you just might find a cell key buried inside this time. Since I don’t actually know Martha Stewart, this is really all conjecture. 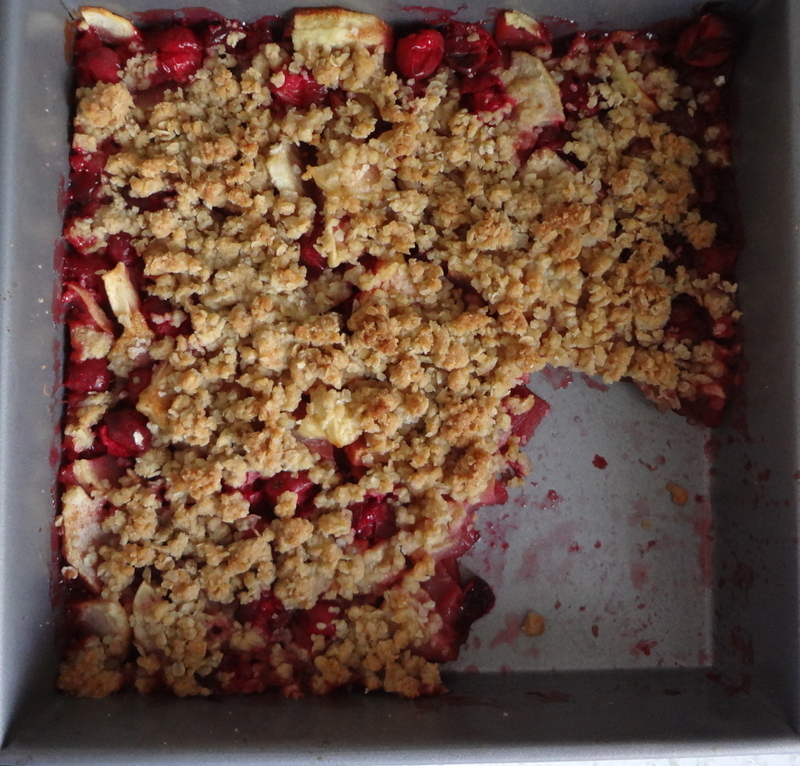 But what I do know is this recipe for cranberry apple crumble is the best I’ve found so far. It’s a must-make for me every year, and for a girl who craves constant variety in her diet, that’s really saying something. 1. Preheat oven to 425 degrees. 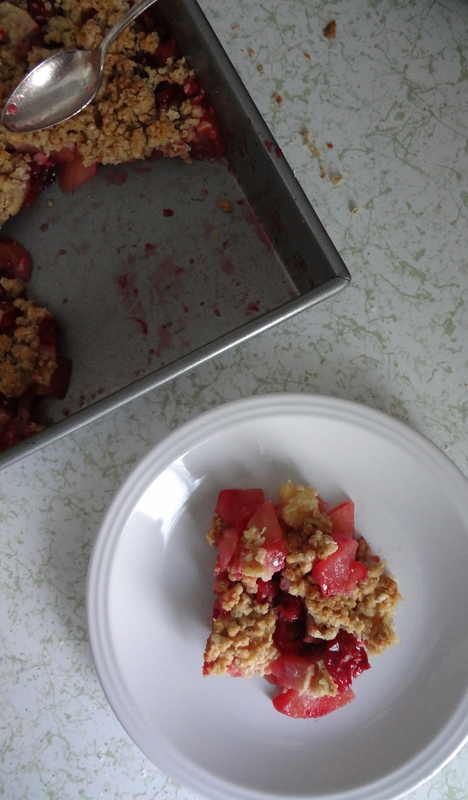 Quarter apples lengthwise, then thinly slice. Toss in a large bowl with cranberries, granulated sugar, cinnamon, and a pinch of salt until evenly coated. 2. Butter an 8-inch square glass or ceramic baking dish. Mix flour, oats, brown sugar, and a pinch of salt in a bowl until combined. Work in butter with your fingertips until topping is crumbly, with pea-size chunks. 3. Spread apple mixture in prepared dish; sprinkle with topping. Bake until filling is bubbling and topping is golden brown, 25 to 30 minutes. Let cool slightly before serving. 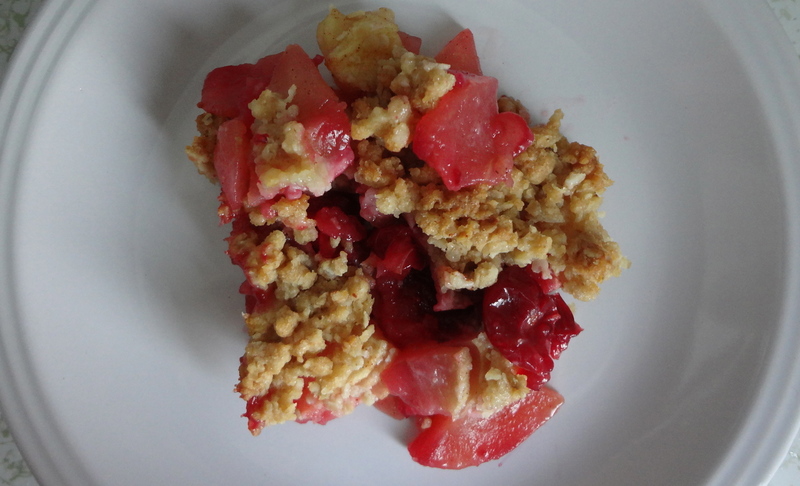 This entry was posted in Uncategorized and tagged apple crumble, baked desserts, cranberry apple crisp, fall crisp, fall crumble, fruit dessert, holiday baking by theculinarycapers. Bookmark the permalink. How much pecans? None listed in the ingredient section. Oops! Totally forgot the pecans! You can go without them, but when I use them I do about 1/2 cup. That’s fantastic! I think walnuts sound delicious, I hadn’t thought to try that – I’ll have to next time. Job well done, Kate! You made me LOL and I am making this for Thanksgiving RIGHT NOW! I love Martha too! My daughter used to call me Martha Jr – even though I’m probably her same age! We could all use a little Martha Jr in our lives – your daughter is lucky! Enjoy the crisp.